Get together with like-minded book fans, enjoy yourself, learn something new and raise money at the same time with a book club fundraiser. You can start up a group from scratch, or make use of one that's already meeting. 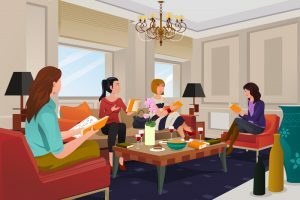 This fundraising event could be the perfect mix of fun and practicality: book clubs are already pretty common, and while they're usually free (so you may not want to charge admission) you can ask for a small donation for refreshments, for example. Another idea is to host a dinner and then discuss books afterwards (over coffee and cakes). See if you can partner with a local bookseller to get copies of your favorite novels at a discount — you could then sell these on to book club members for a little extra to raise money for your cause. Make sure the members know what they're paying for and what the money is going towards. Additional funds could be generated by having one or two of your group babysit for those who want to come along to the book club but have small children to consider. Make sure you find a venue that can fit everyone in, and make sure you enjoy yourself!